Croatia. The beautiful Mediterranean country has become the new Greece, and rightfully so: Croatia is full of seaside towns, gorgeous scenery and historical sites. 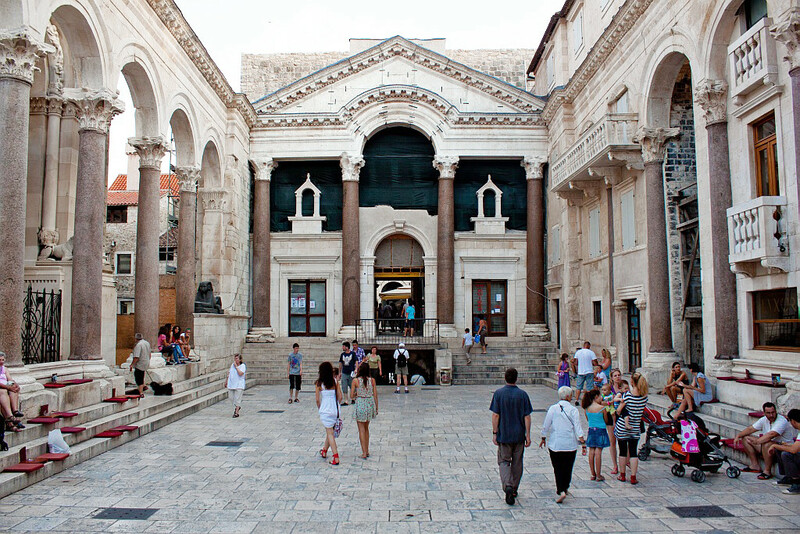 Tourism in Croatia is anchored around Dubrovnik: the impact of the HBO show Game Of Thrones on Croatia’s surge in popularity is impossible to ignore. Famously depicting a vast fantasy world, the show uses Dubvronik for some of its most stunning and iconic sets, and, coupled with social media, it has led droves of tourists to flock to the capital and experience the fantasy in real life. As the Adriatic nation climbs up the world tourism ranks, there’s still a great deal to see and do beyond Dubrovnik. My first solo trip was to Zadar and Split – a RyanAir roulette had me on a plane to the Istrian and Dalmatian coasts for five days. 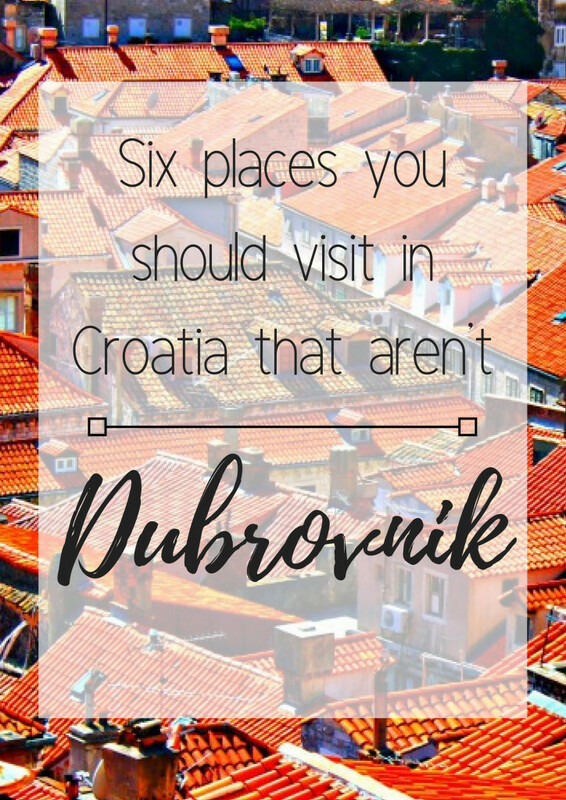 From the first bite of cevapi, I was keen to return to some of the natural and cultural highlights of a broader exploration of Croatia. Hvar Island is not exactly off-the-beaten-path, given that it’s frequently mentioned as a top attraction in Croatia and located near the center of the country (Oh, and Lonely Planet named it “Best of the Best” in 2018, so go before it’s overrun with chain restaurants). From Split, it’s a quick ferry ride and my fondest memory of my night there were the cotton-candy pink sunsets over bobbing boats around an tucked-away bay. The island boasts a beautiful seaside town where you can choose to soak up luxury or simply relax on the beach. 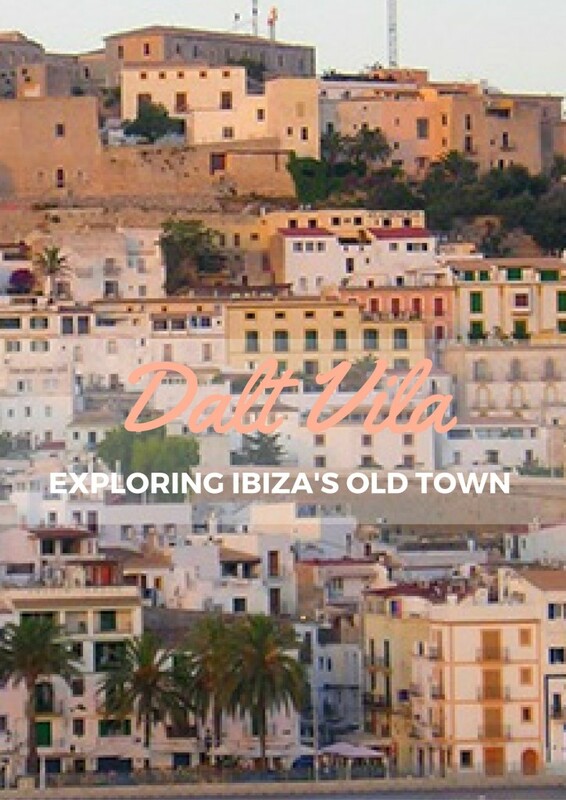 The Old Town, designated as a UNESCO World Heritage Site, is crowned by an old fortress, red-tiled homes toppling down towards the bay. 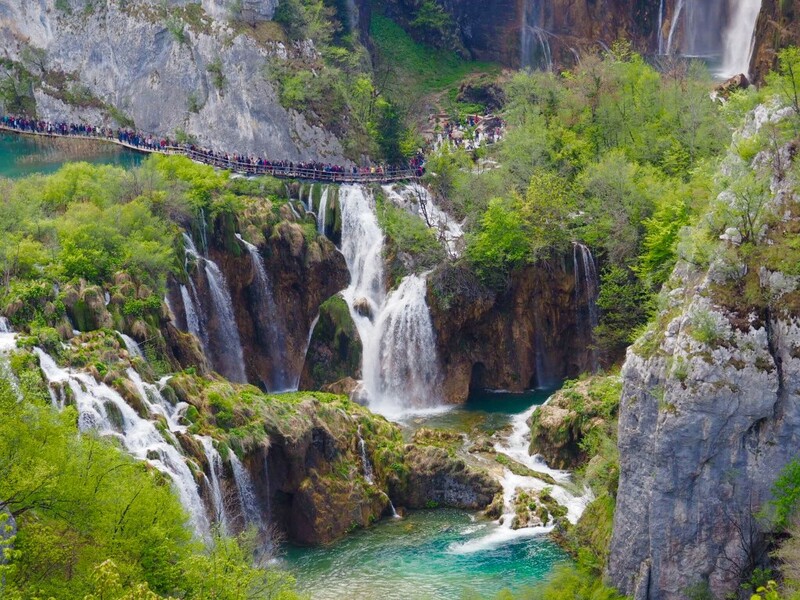 Croatia has a few national parks, and Plitvice Lakes National Park is the crown jewel (and has an argument as Croatia’s most stunning destination). Essentially an opportunity for some nature-based sightseeing, it’s a lush area with over 90 waterfalls and 16 different lakes arranged like terraces – all with walkways winding through and around them. It’s hard to believe the area is natural, but aside from the walkways and a bit of grooming and upkeep, it is! The national park is located inland, close to the Bosnian border, is also a UNESCO World Heritage Site. 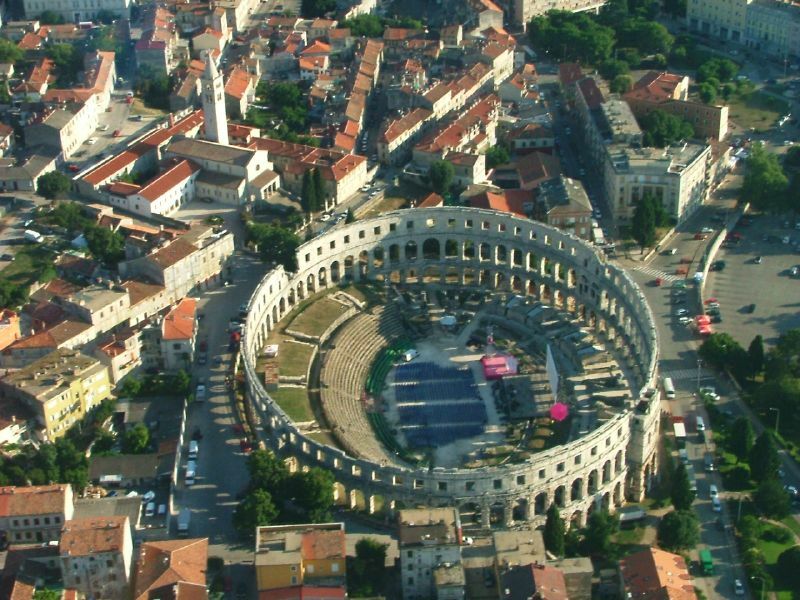 Pula Arena, a 200 year old ampitheatre, is modeled after the Colliseum in Rome and is Croatia’s oldest monument. 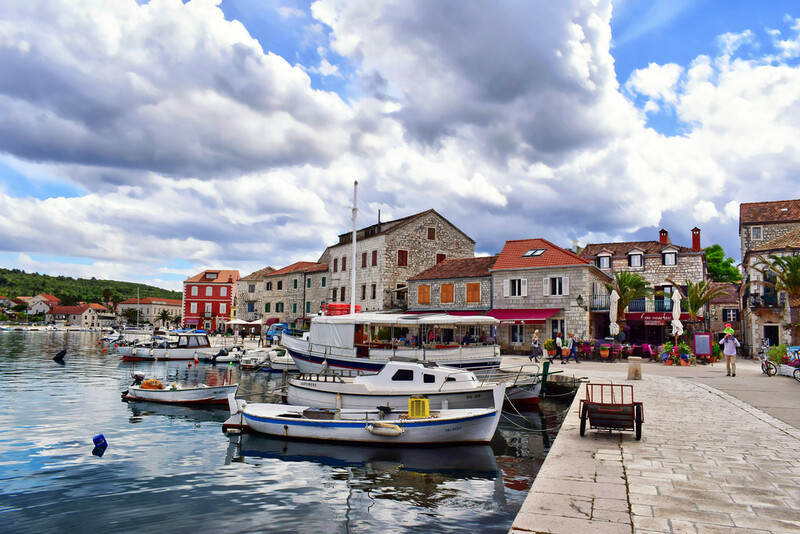 Dalmatian and Roman history is deep-rooted (Hvar was once an important commercial and military town), and Pula was at the center of their empire. Today the arena is used for cultural programming but, architecturally speaking, it is noted for its four intact towers that once held cisterns that could be used for heat control. Do you think they could do that at the Giralda? Romans weren’t the only people to settle in Croatia – Venetians made the Dalmatian coast part of their vast trading empire. 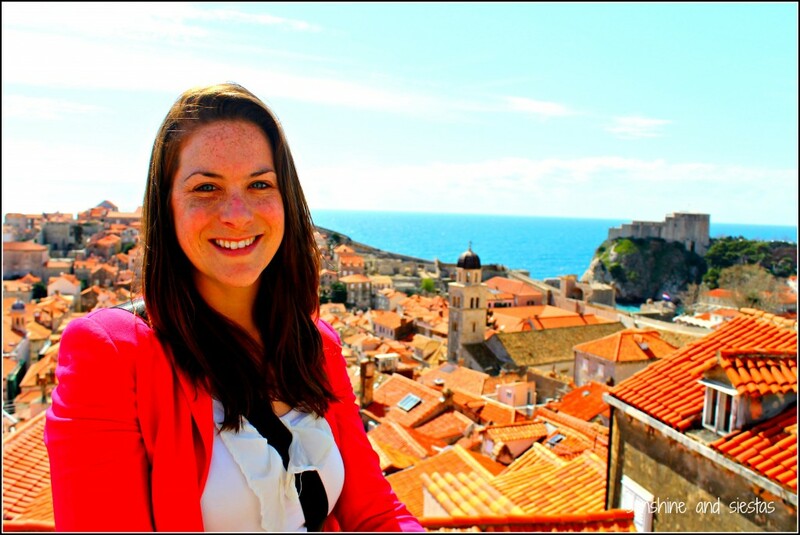 When I spent time in Dubrovnik, it almost felt like I was in Italy – the cuisine and lifestyle echoed la dolce vita. In fact, the first known European casino was founded in the first half of the 17th Century in Venice, and many Croatian islands soon became known for scenery, beaches, and gambling. 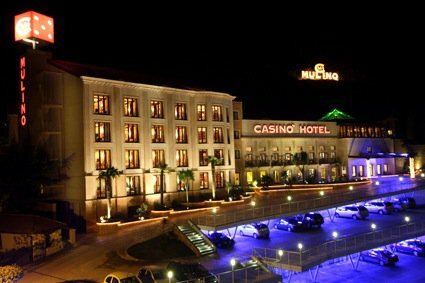 Casino Hotel Mulino on Istria was recently hailed as one of the top casinos in the world to visit in 2018. This one has a classy European feel to it, and actually makes for a nice change of pace from more supercharged nightlife. Another Roman relic dating back somewhere in the neighborhood of 2,000 years. This largely outdoor museum is believed to have been his vacation home in the beautiful area that is now the thriving coastal city of Split. It’s a fascinating historical landmark to explore and, like Pula Amphitheatre, is in surprisingly good shape. Split itself merits time – as Croatia’s second largest city, it has traces of Venetian, Roman and Ottoman rule in its architecture and local culture and has brought up literary and artistic giants. The entire historic center is – you guessed it – a UNESCO World Heritage Site. 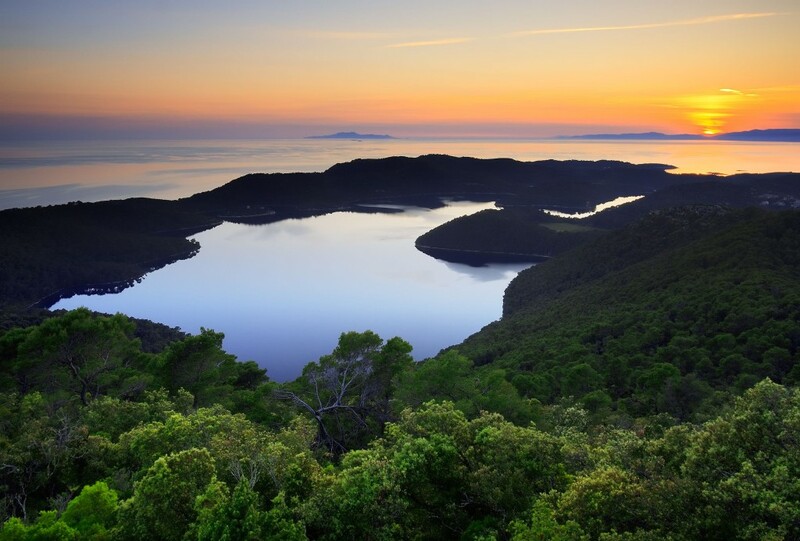 Mljet is another Dalmatian island (in fact, the country has more than 1000 islands! ), but one to keep on your radar if you’re looking to get away from the major destinations, or even civilization to some extent. That’s not to say it’s by any means untouched, but it’s an island full of forests and protected national park land, and with an intriguing connection to myth and history as a rumored favorite of the legendary hero Odysseus. In fact, you can even hike to a cave associated with this mammoth figure of lore! Your high school English teacher would be proud. When should I visit Croatia? You can get to Dubrovnik – as well as a number of other Croatian destinations – through budget airlines in Europe, and ferries operate from Italy and Greece. Because of the surge in visitors, most would suggest shoulder season (May-June and Sept-Oct). 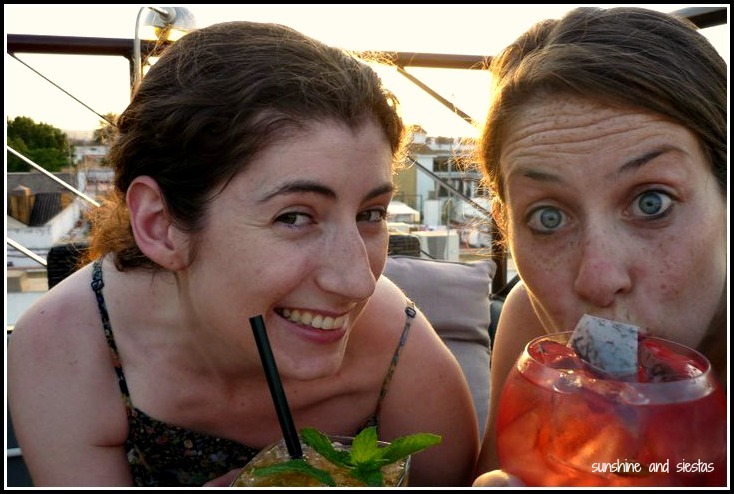 My first visit was in early June, and I found half-empty ferries, cheap hostel beds and a lovely young Couchsurfing host who wasn’t yet jaded from all of the tourism. If you’re in Dubrovnik, considering a pop down to Kotor, Montenegro. Europe’s youngest country is yet to be bombarded with tourists and is a budget alternative. Hayley and I did a road trip after getting our newly-minted EU licenses! 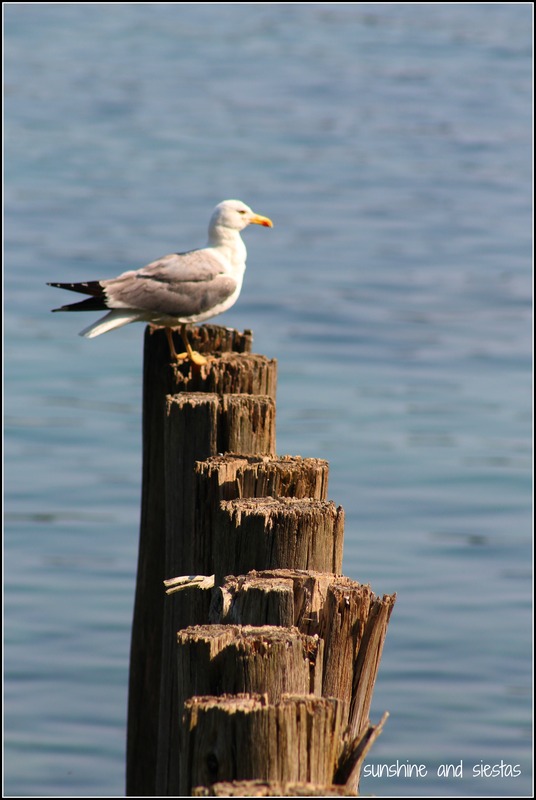 Have you ever been to Croatia, especially inland Croatia? I’d love to hear your tips! Andalusia has the winning combination of weather, history and culture and wallet-friendly prices, making it especially tempting for a family trip to Spain. 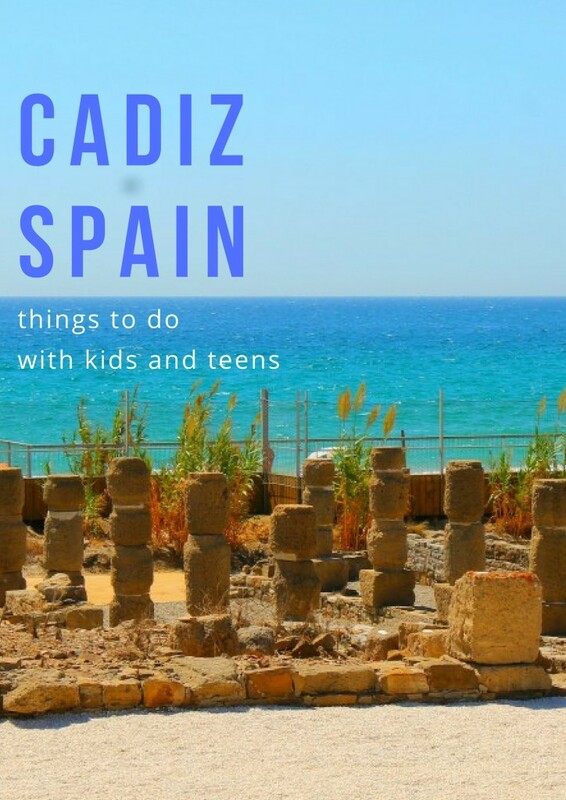 Kids will faun over castles, stretches of some of Spain’s best beaches and theme parks: older kids and teens will appreciate activities dedicated to their interests and energy levels. The pico of land at the very south of Spain (and, indeed, of Europe) straddles the Mediterranean and the Atlantic Oceans, making it one of Iberia’s windiest points and one renowned for kitesurfing and windsurfing worldwide – the town of Tarifa boasts about 300 windy days each year! And if that weren’t enough, the beaches of the Cádiz province are amongst Spain’s best stretches of sand and family friendly, too. For adventurous teens over 14, combination teen summer activity and language camps such as Lenguaventura in Tarifa bring together project-based language learning with sporty activities. Participants can choose windsurf, kitesurf or adventure camps in either English or Spanish, and parents will know that 15 years of Swiss management make the camp safe for their kids. Prices include nearly every amenity; only inscription fees may be added. If you haven’t the stomach for bullfighting, you can visit a ganadería, or a livestock farm, where toros bravos are bred. And not just any farm – that of Alvaro Domecq, Jerez de la Frontera‘s prodigal son. Winemaker and former mayor of the Cádiz province’s largest city, Domecq’s name is almost always synonymous with the toro bravo, as it was Domecq that pioneered artificial insemination to ensure quality stock (and bullfighting on horseback, known as the rejoneo). 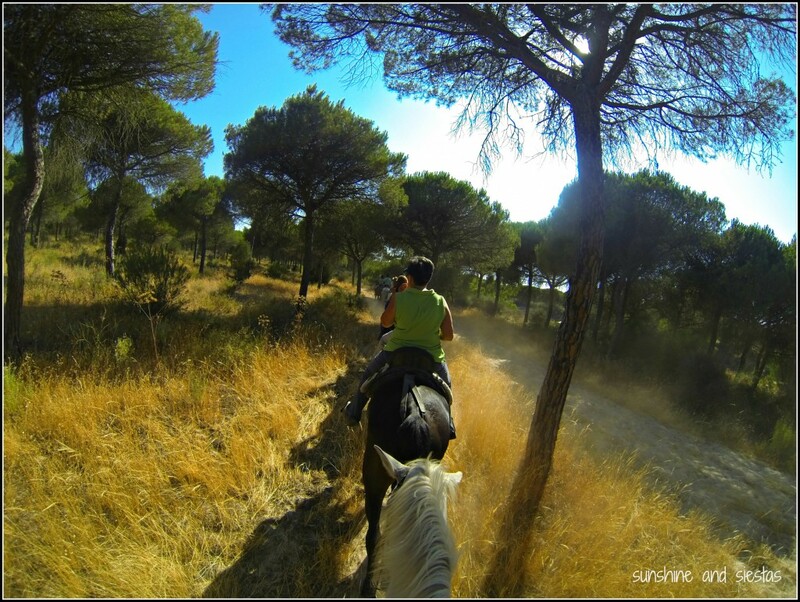 You can visit the family’s farm, inherited just before the Spanish Civil War from the Duke of Veragua, by guided tour. You’ll learn a bit about bullfighting and the rejoneo in addition to seeing bulls, oxen and stately Andalusian horses. Prices begin at 11€ for children, and you can add on sherry tastings and flamenco performances. 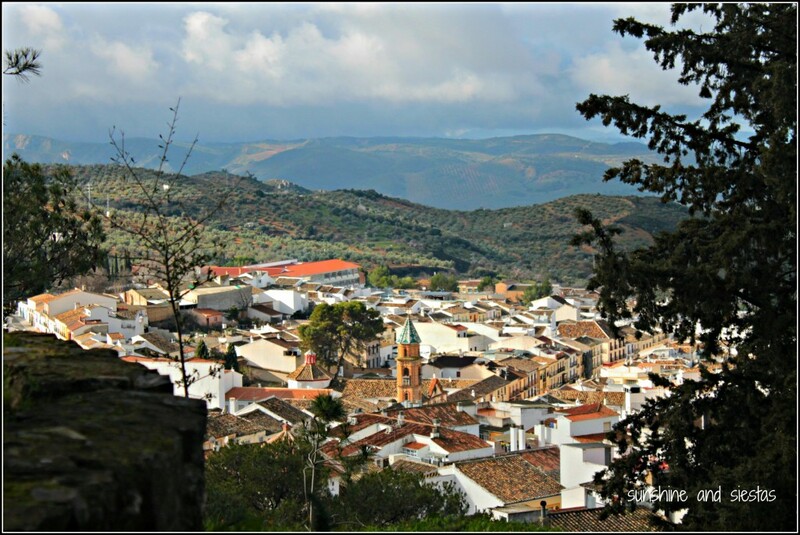 You can book tickets at A Campo Abierto and visit the charming village of Medina Sedonia while you’re at it. Tarifa boasts more than just windsurfing – the Straight of Gibraltar is home to a variety of dolphin species and even killer whales. With success rates hovering over 95%, most companies will offer 2-3 hour boat trips through the Straight, providing information about the wildlife and ecosystem of Tarifa, as well as facts about marine mammals. Not got your sea legs? You could consider adopting a dolphin! Europe’s largest nature preserve and most important wetland, UNESCO-lauded Parque Natural Doñana, straddles the Cádiz, Sevilla and Huelva provinces and is framed by the Atlantic Ocean and Guadalquivir River. Home to the Iberian lynx, wild water horses and countless species of aquatic birds, visitors can visit part of the expansive park as part of a boat ride while on foot (visits to Doñana can only be done via certified tour companies because of park protection measures). Setting out from Sanlúcar de Barrameda (a town known for its sherry production and exquisite tortilla de camarones in case you’re more into the gastronomic offerings), boat tours are about three hours and include a guided visit of the park during two stops. They also serve snacks and refreshments for purchase on the pontoon. Doñana is under threat of more than just losing its UNESCO nod because of deforestation and human-started forest fires, depopulation of its fauna and ecological threats due to industry. I urge you to use responsible tourism companies whose carbon footprint does not add to the problems the park faces. Using old train tracks as their guides, you can actual cycle along the old routes through some of the picturesque pueblos blancos, or white villages. The province of Cádiz boasts four “green ways” between 4 and 46 kilometers long. Snaking 36 kilometers through the countryside and mountains between Olvera and Puerto Serrano, this route (or a portion of it) will take you through natural parks and near rivers, over old bridges and through tunnels that once served the southwest corner of Spain. 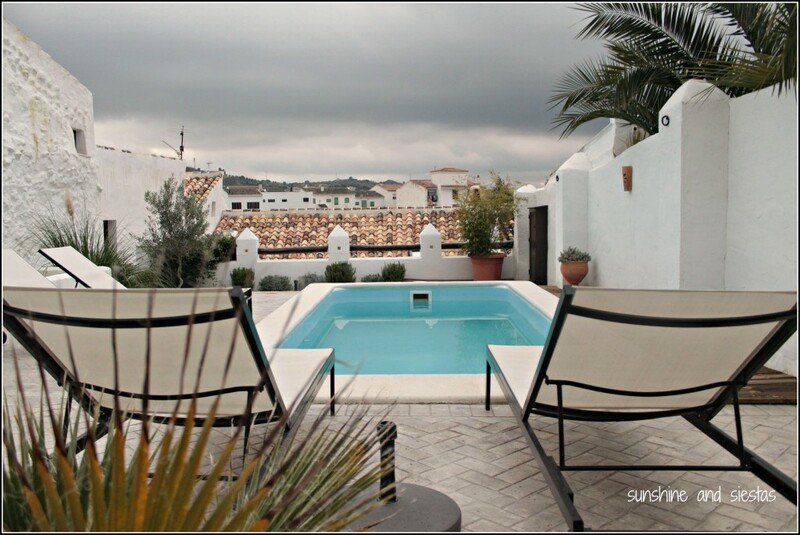 If you’re looking for something closer to Cádiz city, the Vía Verde Entre Ríos travels along the coast between the towns of Rota, just across the bay, and Sanlúcar la Barrameda. Pack a bocadillo, rent bike gear, and enjoy an active day out. 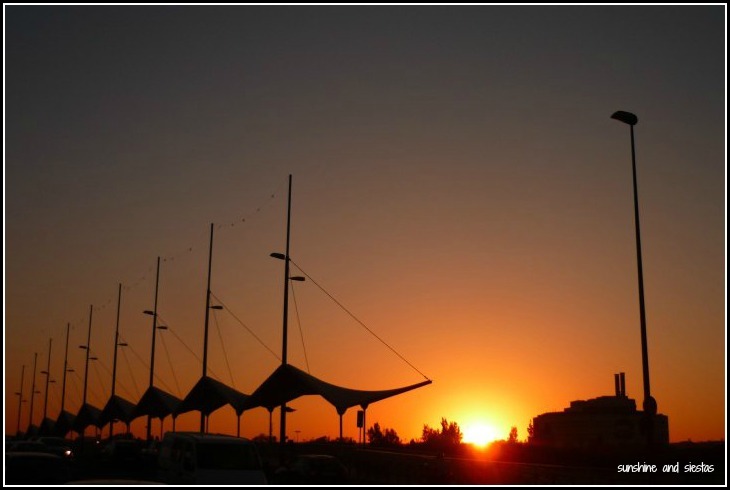 Getting to Cádiz is easy via Seville, Málaga and even Jerez de la Frontera, where you can find cheap connections across Europe and even to the USA via Málaga. There are also a number of charming boutique hotels and campgrounds. Looking for more activities for kids and teens further afield? I’ve written about my top picks for families in Andalucía and great things to do with kids in Madrid. I’ve also written about a number of UNESCO World Heritage sites, many of which can be found in Andalusia. 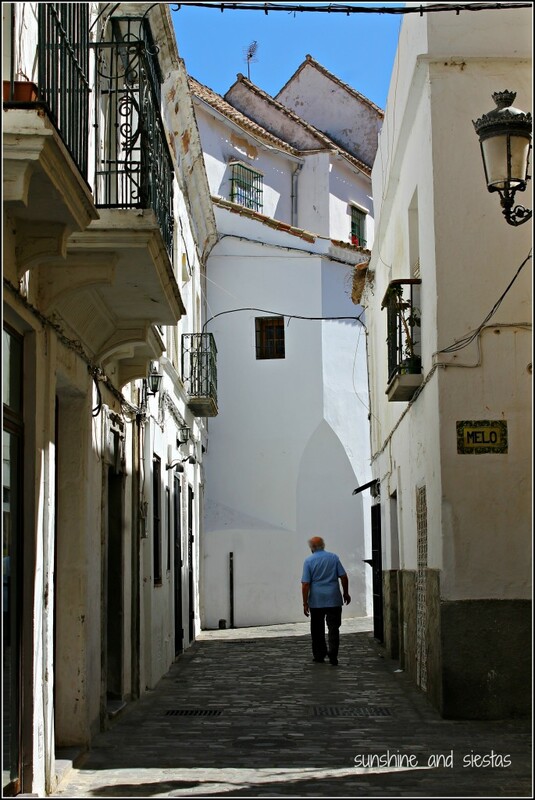 Do you have any tips for great, interesting things to do with family in Andalucía? 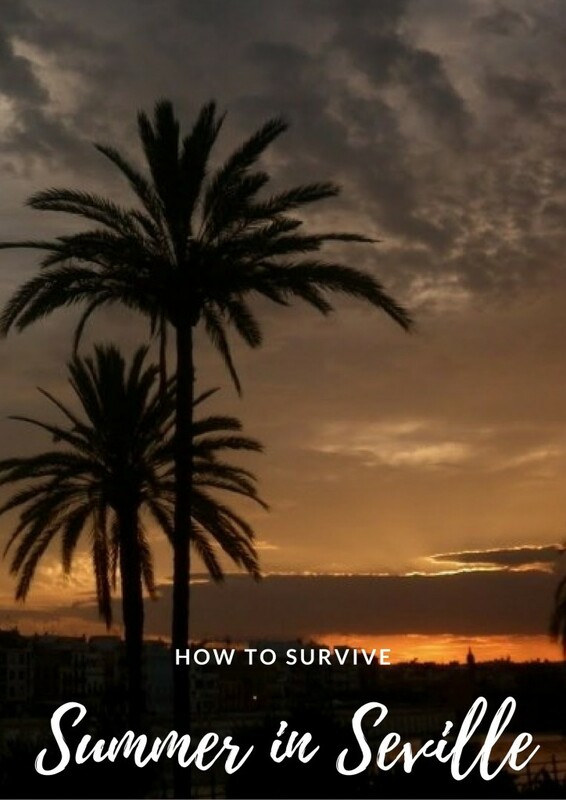 Something odd happens in Seville in late spring. As the temperatures being to rise into the 30s and 40s, there’s a shift in activity. Streets clear, parking becomes available, and midday siestas are the norm. Welcome to Summer in Seville – a No Man’s Land of sloth, extreme heat and an abandon of local habits. When I recently spent my holidays at “home” in Seville, people called me crazy. “A pasar frío, no?” was usually met with eye rolls. 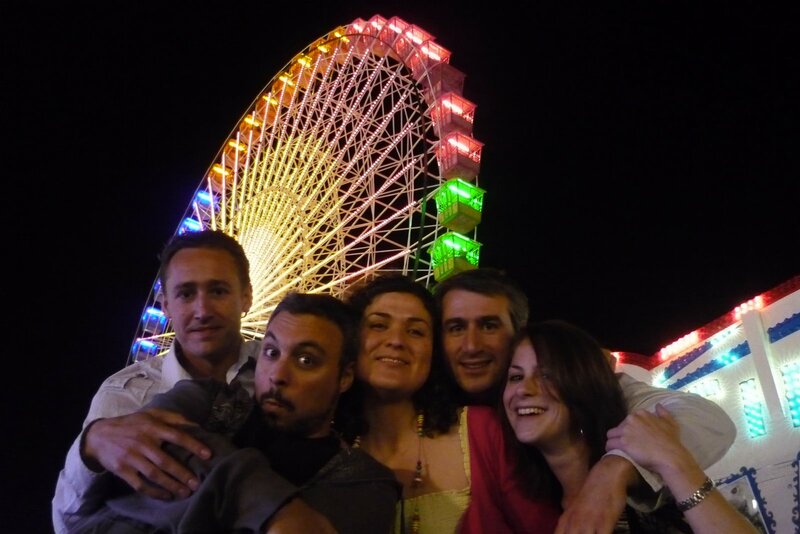 But I actually love the summer in Seville and its oddities (and daycare is burning a large, large hole in our pockets), so it was an easy vacation destination. Who can pass up a free place to stay and free childcare? Seville isn’t a coastal city, despite being in beach-packed Andalucía. The city sits on the Guadalquivir River in a fertile valley of the same name, making it a greenhouse with its own weather phenomenon, called the bochorno. This means grey skies, unbearable heat and enough humidity to make my usual nub of mousse unnecessary (upside?). Firstly, do as the sevillanos do and hibernate. Morning markets buzz with patrons until about 11am. From that hour, as the sun reaches its peak in the sky, the streets are a virtual ghost town. You might see a lone person slinking along in the shadow of a building, but generally speaking, people stay at home during the day. Many older homes in the center of town do not have air conditioning (this is not true of hotels or rental apartments, so take advantage of that low thermostat! ), but instead have a typical Spanish invention called the persiana. These heavy plastic window blinds help block out light and heat and – by some sort of witchery – also seem to induce sleep. Embrace the siesta culture and take a midday snooze, especially because the streets become lively again after 9pm, when people descend on the cervecerías and spend the night at Seville’s best terrazas, or an outdoor disco. And if you still can’t sleep, take the 1970s approach to A/C – visit the Corte Inglés department store or see a movie. In fact, local lore suggests the change in temperature from the street to the store and back again causes colds. Additionally, you can change your diet up a bit. Summertime means you can pack away your pressure cooker and forget about the hearty cuchareo that characterizes winter stews. 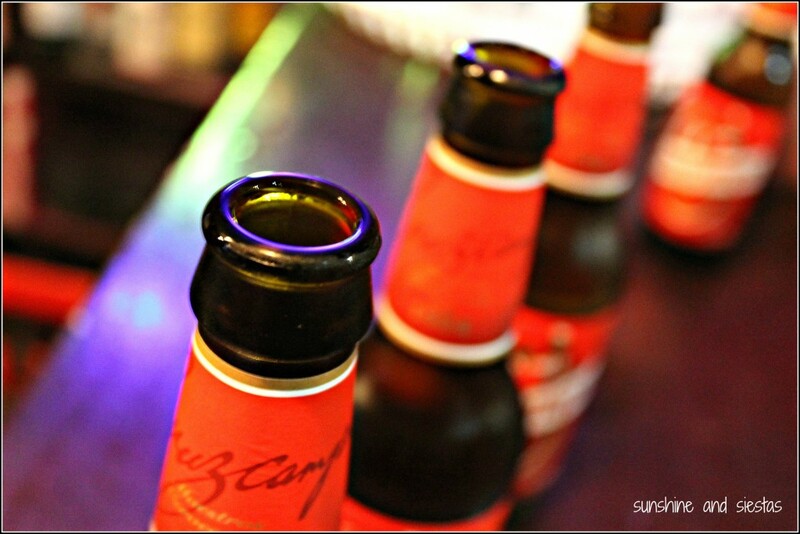 Any local will tell you that a glass of cold Cruzcampo beer will stave off hunger during the hottest hours of the day, and many choose to adapt their diets to cool foods – gazpacho, salads, granizados – a slushy fruit juice made with ice – and seafoods. And beer. Loads of beer. My favorite cervecerías during the hot months never let me down: Cervecería La Grande if I’m near home, and La Fresquita if I find myself in the center. Sevillanos can be a curious bunch, often spending money on things we deem important that others may find frivolous. 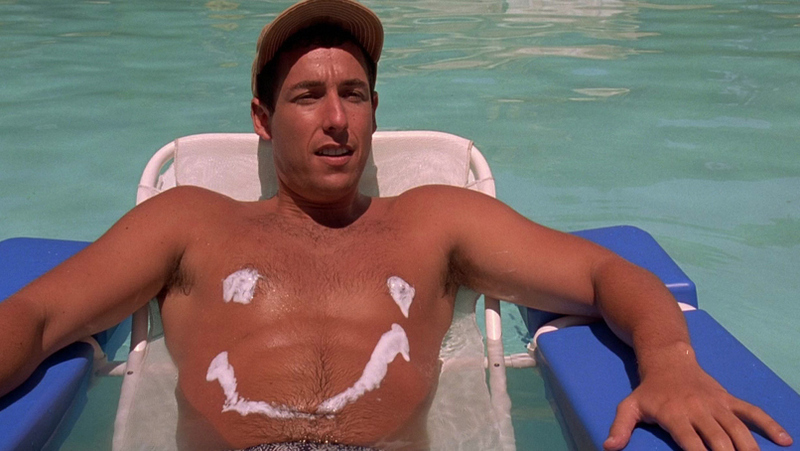 But some of the best money spent during the veranito sevillano is taking out a pool membership, called an abono. During our trip, all of our afternoons were spent at the pool, alternating who took the baby to the kiddy pool and who got a few moments in the adult pool, where the water covered more than just our ankles. Terraces and pools have popped up in the last decade: check out Ocean Club or the public pools in Sevilla, or make like my amigas and just waltz into one of the rooftop hotels, like EME, and pretend like you’ve rented the suite. And don’t think summer is limited to the calendar – whenever you think the temps are finally returning to normal, you’ll get the resurgence of Verano de San Miguel in late September. Your summer clothes won’t get packed away until mid October’s first rain. Our summer holidays this year included a repeat trip to Asturias to show off Baby Enrique before taking the AVE to Inferno. Lots of naps, half the day in the pool and free childcare. But, somehow, it feels good to be home and taking advantage of those hot summer nights for bachelorette parties, a baby up past his bed time and even a blissful, baby-free litrona shared on our terrace. A sticky, legs-plastered-to-cheap-plastic-lawn-chair-yet-baby-free-litrona, that is! We’ll be back this weekend, camped out in front of the A/C and wishing anywhere but La Grande was open! Have you ever spent the summer in Seville? How did you cope? As soon as we’d pulled off the A-8 and onto the N-632, my brain kicked into gear: I’d been here before. This very same roundabout, where we’d dodged cars as we lost the trail of yellow arrows at daybreak on the second day of the Camino del Santiago del Norte. “Cat, I’m driving. Shut your pico and tell me where I have to turn,” the Novio said, straight faced and without taking his eyes off of the road, whose grade nosed dangerously down the steep N-634 that runs parallel to the northern coast of Spain. 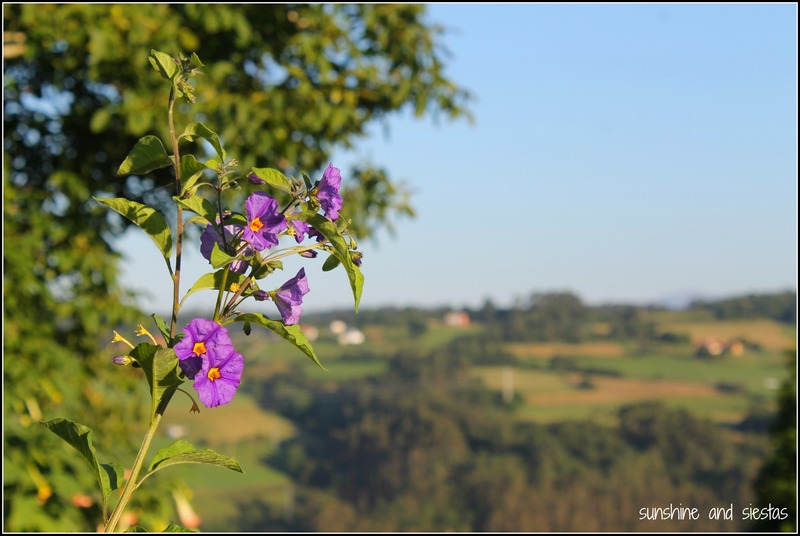 There are two ways to see the very best of Asturias: by foot and by car. The little mountain villages and pristine beaches are out often of the reach of the rickety old FEVE trains and buses, so retracing my steps on the Camino de Santiago del Norte was an absolute treat. 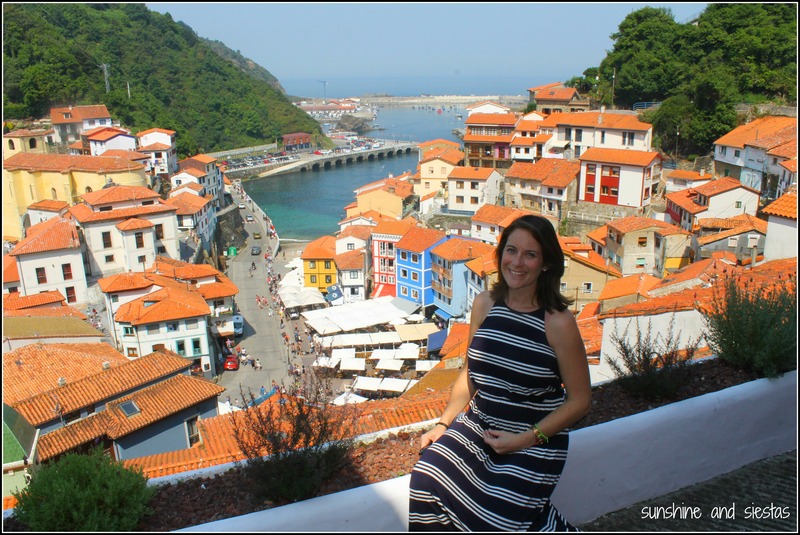 Deciding to spend a long weekend in Asturias was easy – not only is it our favorite part of Spain, but the Novio and I were celebrating our birthdays, our first wedding anniversary and my pregnancy reaching 20 healthy weeks (the gender reveal was a birthday gift to us both!). What wasn’t easy were the logistics: being a long weekend in August, trains were booked or prohibitively expensive, and both of our cars were standing guard outside of our house in Seville. We’d need a rental car if we expected to do anything. I will fully confess that I’d never actually booked a car myself! Always in charge of itineraries and lodging, I’d traversed India, planned a trip to Marrakesh and spent six years in Spain without needing to get behind the wheel. I didn’t even know what rental car companies operated in Madrid, let alone in which areas of the city, so I used EasyTerra to score a cheap compact from nearby Nuevos Ministerios. The service compared the nearby agencies, like Sixt or Enterprise, leaving only the lodging and itinerary (also my job on this trip). My last trip to Asturias, I’d walked from Avilés to Figueras and across the Río Eo into Galicia, the Bay of Biscay always accompanying me to the left. Three years to the day after we’d arrived in Santiago, we picked up an Opel Meriva and began the trip north. Glancing at the rearview mirror just past 2:30pm, I saw a snake of cars converting the AP-6 highway into a summer traffic jam. 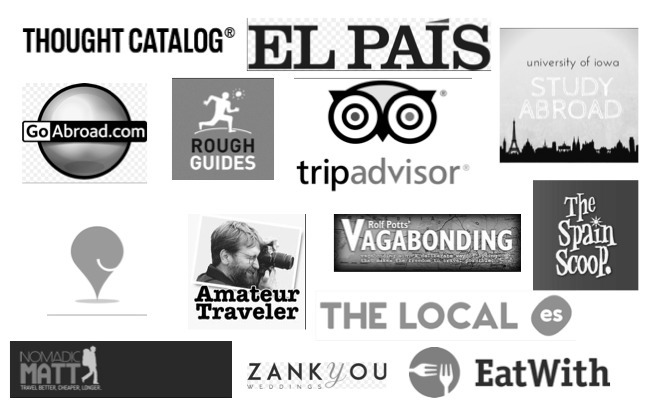 After rejoicing in the lack of people in Madrid for the first half of the month, it seems we’d found them all. As soon as we’d past the M-50 ring road and the traffic eased up, we stopped for a bocadillo at a roadside bar. All epic road trips in Spain feature a simple sandwich on a dusty road, after all. The Guadarrama mountains melted into the arid plains of Castilla – where I’d studied abroad – before we caught the AP-66 at Benavente. An hour later, we’d exhausted all radio stations but Radio María, but the music went off, the windows went down and the Picos de Europa rose before us, signaling our passage into Asturias. As soon as we’d diverted past the capital of Oviedo and gotten on the A-8, I was flooded with memories of blisters, long walks and conch shells. I began remembering small details of our 200-mile hike, from memorable meals to cat naps in the shade of a picnic table. We turned off the highway at exit 431, and my eyes grew wide. “I’ve been here! I know right where we are!” Guiding the Novio around the roundabout by way of the spraypainted arrows, I was almost delighted to find that the next roundabout was under construction, just as it had been three years earlier. I could feel my calves tighten as the narrow road climbed downwards, past road signs announcing the Camino’s crossing over the highway and remembered our descent towards La Concha de Artedo. 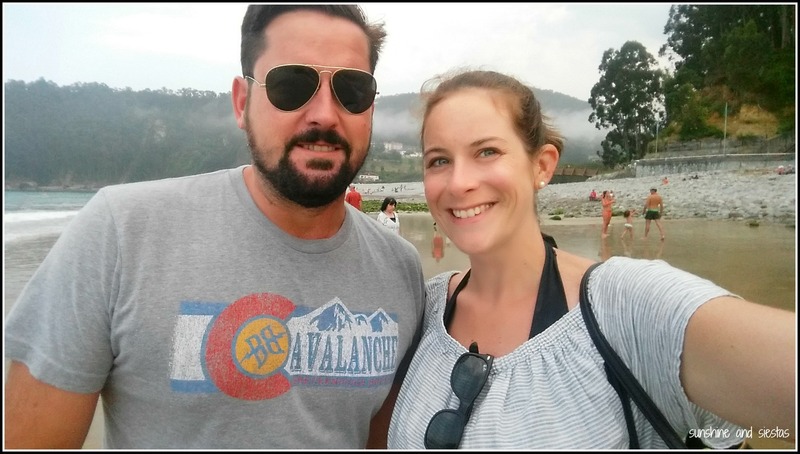 At the bottom of the hill, we entered onto a mountain road that climbed out of a thick forest to hug curves around rolling, green hills dotted with hamlets and dairy cows. Soon after, my mobile signal was lost. It wouldn’t be back for most of the weekend. La Casona del Faedo said it was in Cudillero, the technicolor fishing village I’d visited on my first afternoon of the Camino. 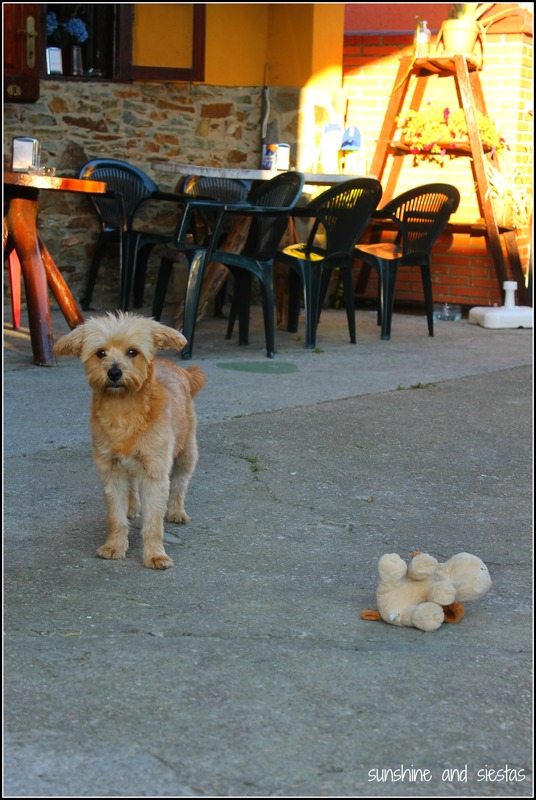 It was an inexpensive, so we booked without realizing that it was in Faedo, a miniscule farming village in the Consejo, or district of Cudillero. But the air was crisp and the farmhouse was quiet, save the far off tinkling of cow bells. Ángel showed us to our room in the 130-year-old stone stucture, having recently reopened the family home after more than a decade in Lanzarote. He hailed from Pola do Siero, just like my mother-in-law. The internet signal didn’t reach our room – and neither did the 4G – so we passed time asking him for recommendations for food and sites. Dusk fell over the valley, and we were back to the winding CU-4 towards the A-8. In Oviñana, we drove narrow roads to Sidrería el Reguerín. There was no place to sit on the patio, so we sidled up to the bar and had a bottle of cider uncorked before I could even ask for a free chair. 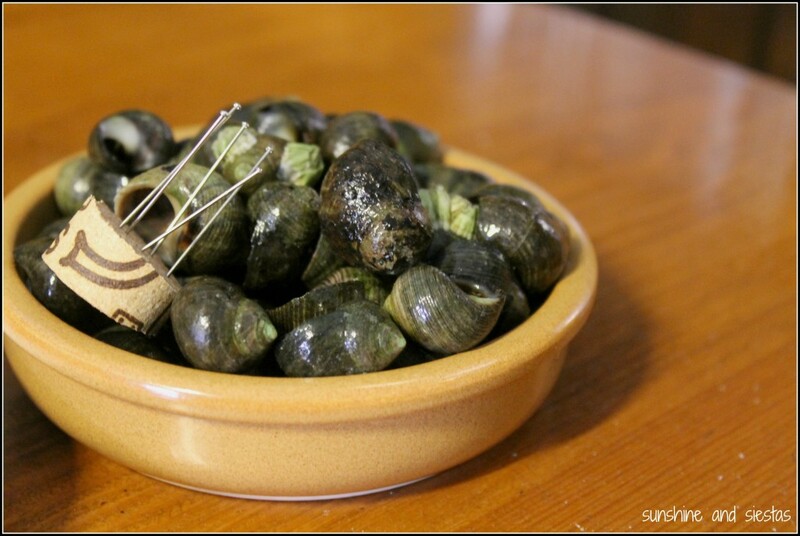 The culín de sirdina was tart and cut straight through the acidity of the octopus salad set before us. This is one of those places that has a set menu, but it’s always better to order whatever is written on the chalkboard. 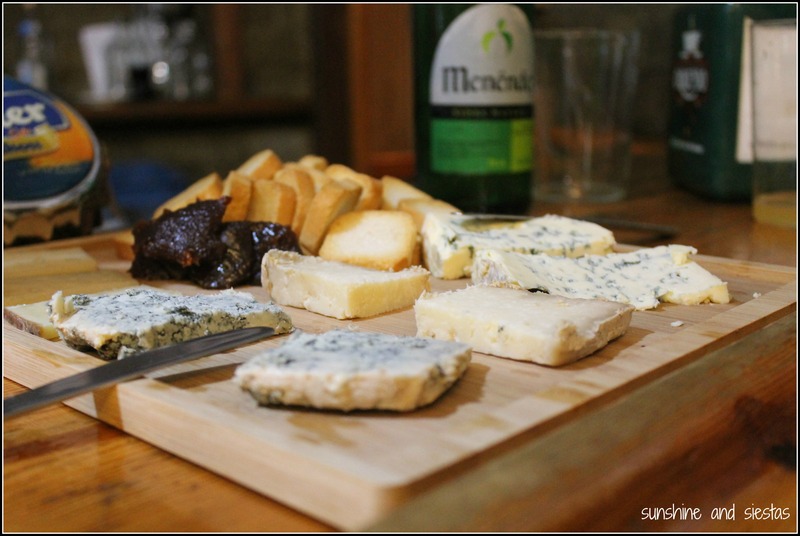 Downing another swig of cider and perking his nostrils, the Novio dove right into Asturian cuisine, ordering an immense cheese platter with quince pastes that disappeared within minutes. I’d have been satisfied, but no sooner had I run my finger along the knife to eat the last few crumbles of cabrales, a dish of fried zucchini stuffed with crab meat came out. The murmur of dinners grew louder as cider glasses were slammed on the wooden bar in rapid-fire fashion. 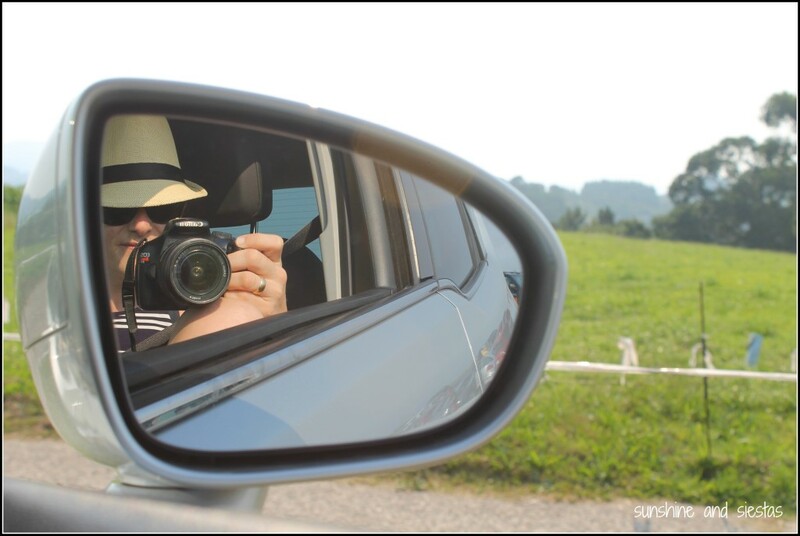 I took the wheel this time, nervously driving back towards Faedo on the hilly, unlit road. Agustina wiped her hands on her apron as she walked out of the kitchen. “Can I interest you in some of my freshly baked cakes?” We gladly obliged as Ángel poured the Novio a coffee from an aging copper pot and followed it with fresh milk from across the valley. Agustina had been up early making a cinnamon coffee cake and pestiños – a honey soaked, fried pastry. The Novio inquired about where to get the best smoked sausages and fava beans as Ángel nervously checked his watch. “You should hurry and get to Muros de Nalón. They’ve got a weekly market on Saturdays with just about everything. A quick gulp of coffee later, and we’d jumped into the rental car and zoomed down the mountain, windows open all the way and the Novio’s hair, normally weighed down with hair gel, gently flapped in the wind. Muros had been one of the first towns I passed through on the Camino, upon leaving Avilés and walking in a few circles around Piedras Blancas. We’d rewarded ourselves with a beer before the last ascent into El Pito, where we’d splurged on a nice pensión. 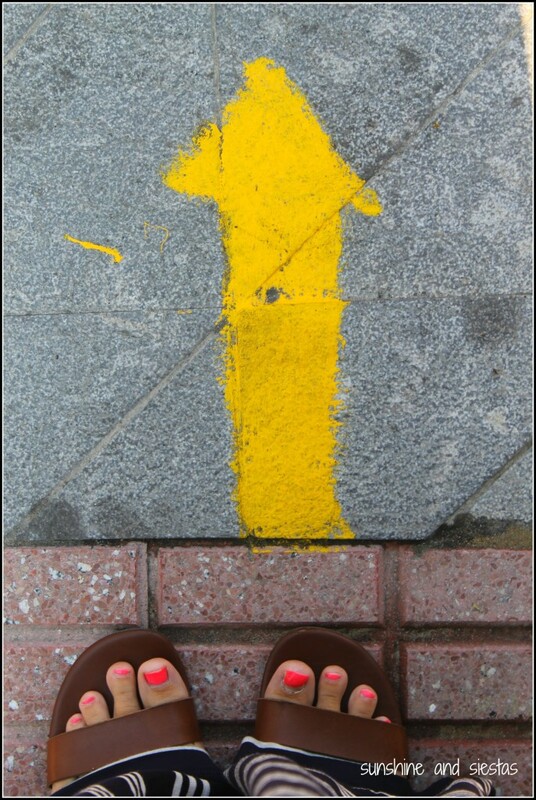 The car came to a halt just under one of the blue and yellow tiles marking the path into the center of town and the market. More than food stalls, we found clothing stands, used books and more people milling about the bars than the small market. While the Novio checked out the long coils of chorizo and morcilla, my nose drew me to the baked goods, where I bought a loaf of bollo preñao: sweet chorizo, strips of fatty pork shoulder and a few boiled eggs baked into warm bread. Lunch was solved for 5,50€. The Novio’s stock included six or eight links of both morcilla and chorizo to make fabada, a hearty bean stew. 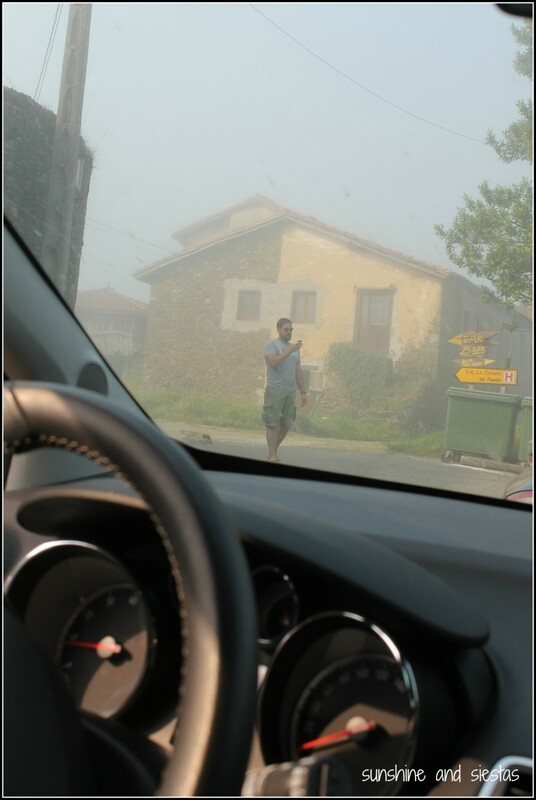 He downed a few culines of cider before we pointed the car down the hill towards Cudillero. Our first night on the Camino included a stop in Cudillero, dubbed as one of Spain’s most beautiful villages. 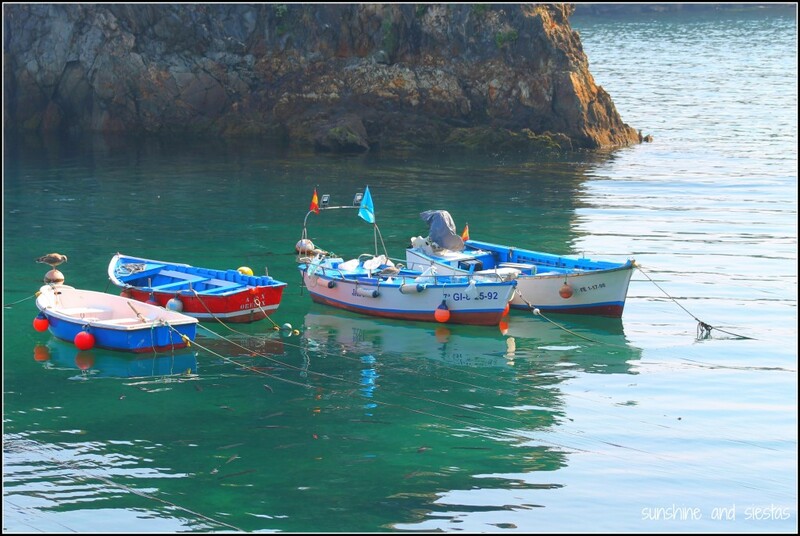 Tucked into a natural bay and protected by rock formations, the sleepy town bubbles over during the high season. And interestingly enough, the town is said to have been founded by Vikings who sought a safe port in its natural breakaways, leading to a local dialect, Pixueto. 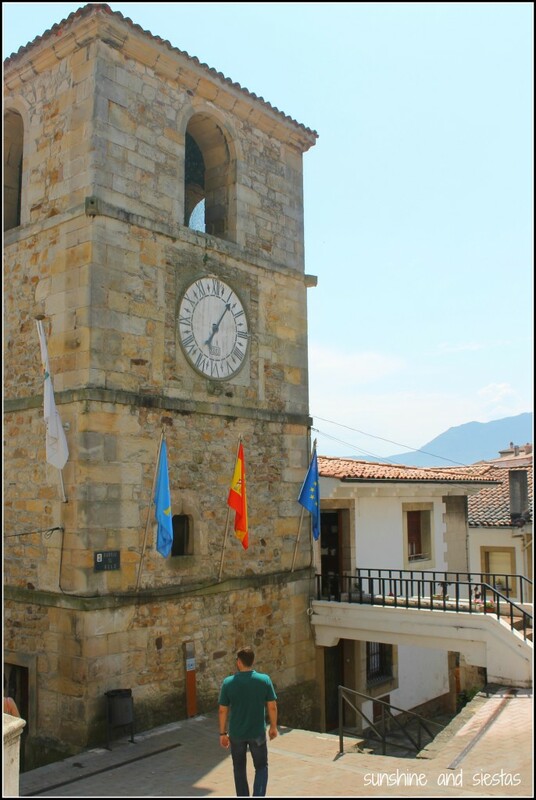 In late July, 2013, our legs had been too tired after 26 kilometers to do much else but have a taxi pick us up in El Pito and take us right to the port and its cool, pebble-streaked waters and central cider bars. Three years later, the Novio and I climbed the stairs leading away from the village center to the carefully stacked houses and sidewalks that tumble from the cliffs. Cudillero was just as quaint and colorful as I’d remembered it, though so overrun with tourists that I felt overwhelmed and uncomfortable. Just a simple look over his sunglasses was all the Novio needed to say for us to retreat to somewhere a bit quieter. “Which way to the Pilgrim’s Inn?” asked the peregrino, eyes, squinting in the hot afternoon sun. His face was streaked with sweat and a bit of dirt, evoking memories of ending up, at 1pm, in much the same state. I pointed up the road, indicating that he make a right just after passing the church, where he’d find a bed for cheap in an old converted hospital. The Novio put out his cigarette into a conch shell ashtray as we watched a few more scattered pilgrims arrive to the bar we were sitting in front of, dip in for a cold drink and continue on to a nap. The bar was the first in Soto de Luiña – and based on the fact that it had run out of food by 2pm, it was likely the most popular. We’d walked steadily along the A-632 that morning, dodging cars and cyclists on our way to Ballota and its virgin beaches. The Novio bought a bottle of beer and a bag of chips and instructed me to wiggle into my bathing suit while we drove towards the nearest beach. 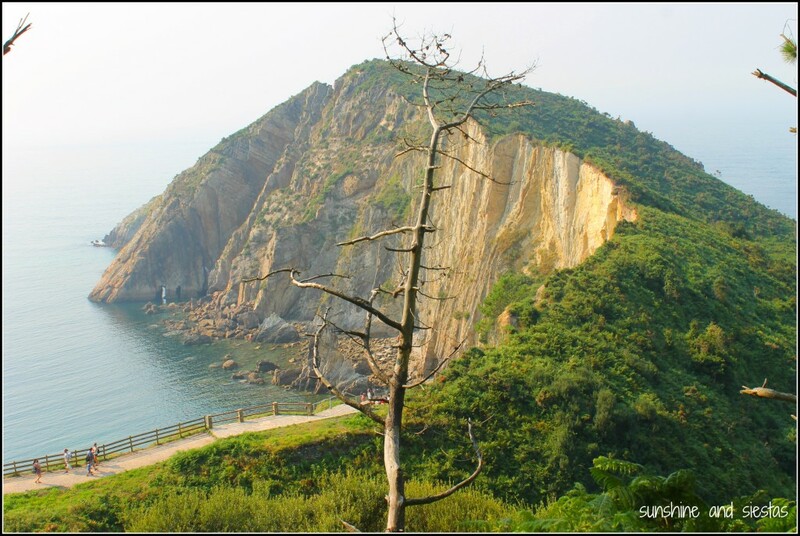 I’d often heard that Playa del Silencio was one of Asturias’s best, given that it was inaccessible if you didn’t arrive on your own two feet or in a sailboat. Cradled by a sheet rock cliff and a thick forest, the nearest “village” is several miles away, and there are no chiringuitos or even a lifeguard stand. The car park led us to believe that the place was crawling with beach goers, but most we met on the way were heading back from the beach. The gravel path led down to nearly 350 stone steps that were narrow enough that onlyone person cold pass comfortably through. My nice leather sandals crunched uneasily over the smooth stones that made up the beach. Even with the 513 meter stretch of beach full of people, there was… silence. Save the breeze whipping past mey ears and the ocean lapping at the rocks, it was eerily silent. We passed the bollo preñao between us, contemplating the next 20 weeks and what would come after. I treated our weekend as a babymoon of sorts, a few fleeting days when it would just be the two of us, when we could called the baby “Micro” and when my belly just looked like a little bit of bloat. I plucked my straw hat from my bag and rested it gently over my face, succumbing to yet another afternoon snooze – savoring every one of them I’d get before the baby arrives. Washing the salt off of my body, I heard the Novio downstairs speaking with Ángel as his beer glass clinked against the wooden picnic table that we’d come to claim as our own. Not only was it a long weekend, but it was when many villages in Asturias celebrated their local festivals, making for a madhouse in villages that didn’t have the infrastructure for so many cars, tourists and hungry bellies. 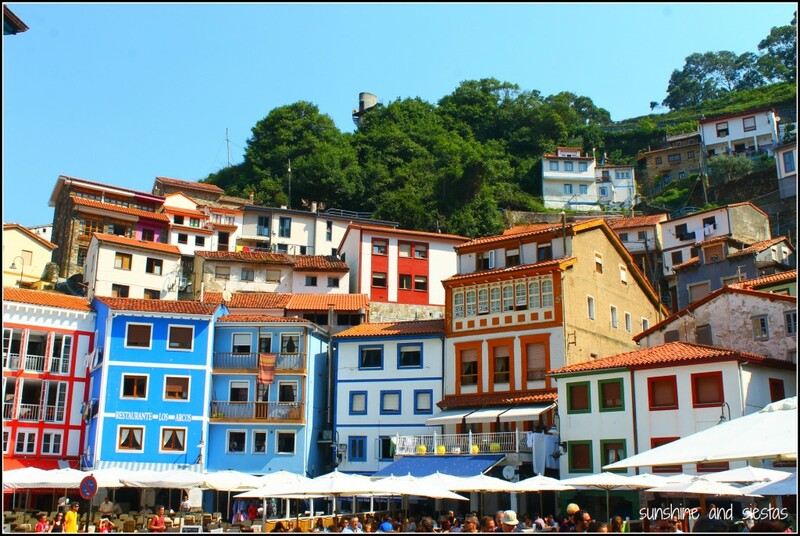 We decided to try for Luarca anyway, another large fishing town where Hayley and I had spent a night. 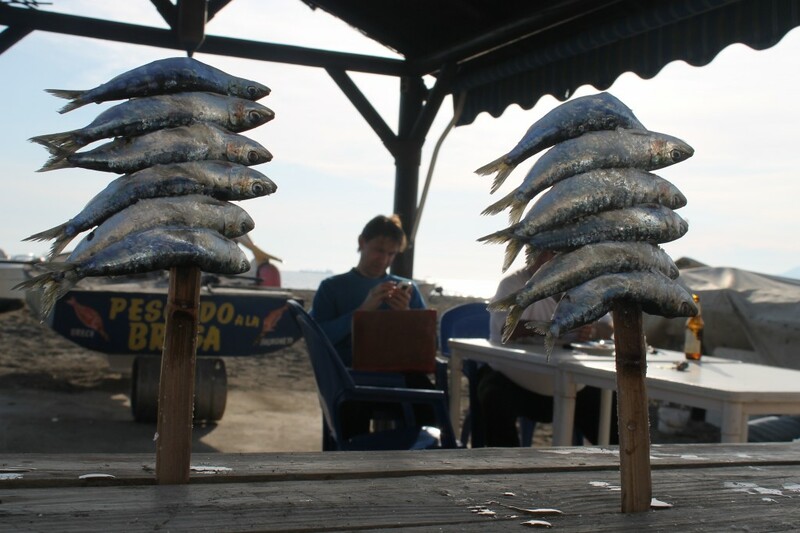 I remember finding it devoid of much life – it was grey (the water in the bay included) with most of the town shuttered up, despite being called the Pueblo Blanco de la Costa Verde. But in fiestas, it might just prove to be a bit more lively, and local favorite El Barómetro told us they had space at the bar for two. We drove in circles around the large port and up to the picturesque cemetery looking for parking, but it was futile – we were onto the next village, Puerto de Vega, as soon as we’d determined that even the vados had been taken. Puerto de Vega was decidedly sleepier, but for Casa Paco. We nabbed the last unreserved table in the dining room, a chill chasing us in from the port, where a few white and red fishing boats bobbed up and down with the wake. The octopus was tender, the cachopo – a pork loin wrapped in cheese and ham before being deep fried – as long as my forearm. That night in Faedo, I didn’t last five minutes in bed (with covers on!) before I fell asleep to the lull of the diners in the bar below, waking up the following morning to crickets and cowbells as the fresh dew still lingered on blades of grass. We skipped the pestiños in favor of fresh cheese bought from the neighbor and crushed tomato on bread that Augustina pulled out of the oven with heavy mitts. Unsatisfied with yesterday’s yield of products, the Novio had already spoken to her about the market in Grado. 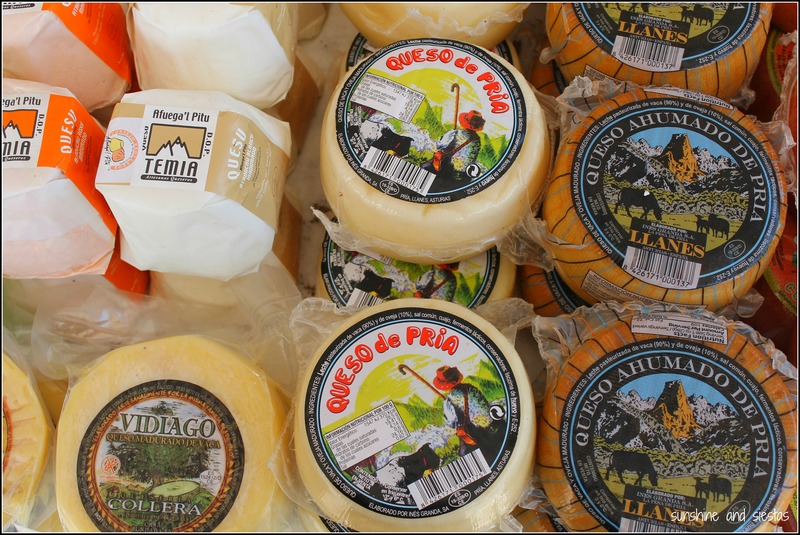 Due to its position in a flat, fertile valley, the consejo is rich in gastronomic tradition, particularly cheeses under the D.O. L’Pitu and beans. The roads were foggy and damp that morning as the car slid down the valley into Villafria. Ángel gave us instructions as only a born and bred asturiano could do, full of local words I couldn’t grasp, waving hands and landmarks. We somehow arrived without getting lost (though we had to screenshot the way on our phones due to lack of a mobile signal). 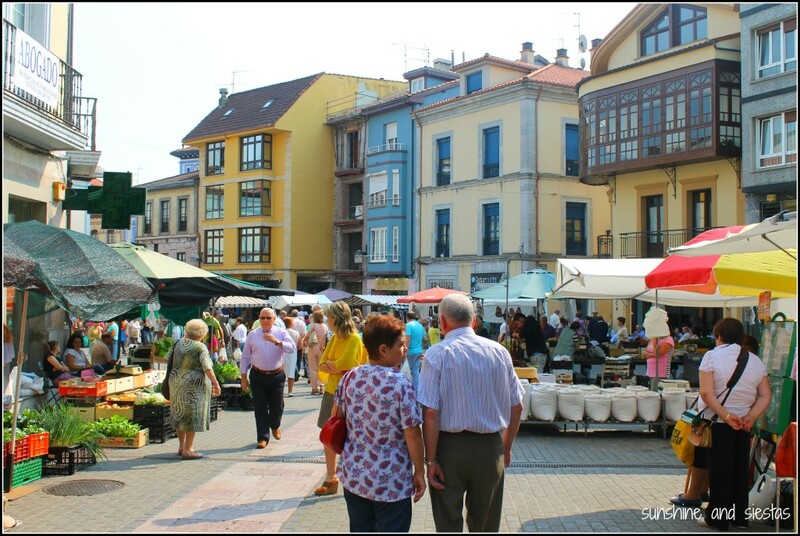 Known locally as Grau, the entire town shuts its central streets for the massive weekly market, and shops stay open, closing instead on odd days. We fought our way through crowds and vendors hocking socks, fake watches and clothing to the Plaza General Ponte, where the traditional market has run every Sunday since 1258. I went to check the free samples on cheeses while the Novio proudly announced that the chori-morci he’d bought the day before were fresher. We tagged team the whastapps, making the rounds to ask which family wanted fabes or fabines for winter stews. A kilo of good quality fava beans in Madrid was nearly twice as expensive at 20€/kilo: prices in Seville could be up to 10€ more! 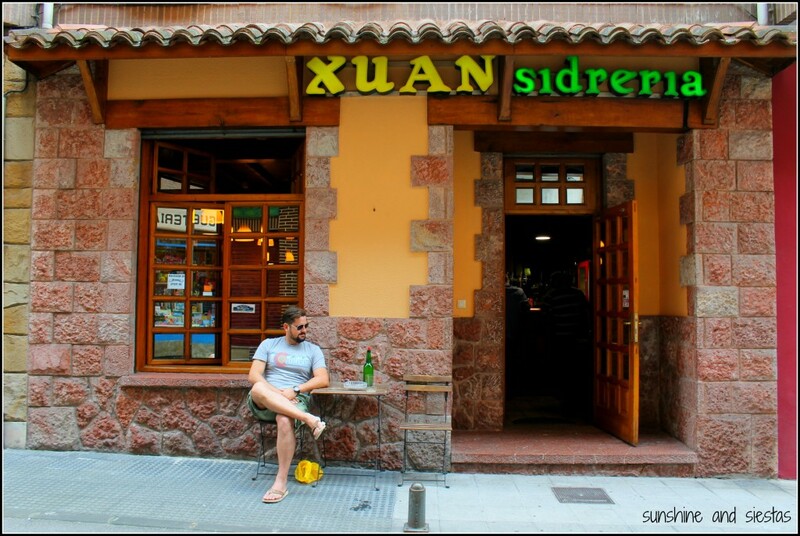 We walked back to the car with arms laden with cheeses, pig shoulder and beans, stopping briefly at a sidrería for a refreshment. Our late start meant we’d finished shopping right about lunch time. Agustina had suggested the hearty menu at Casa Pepe el Bueno which, at 17€ per person per menú del día (on a weekend! ), was more than we’d paid for a meal all weekend. The low-ceilinged restaurant was as stuffy as it was packed with people. For a starter, we both chose fabada, served in an enormous silver bowl, meaning two plates each. “Now Micro knows what a true fabada is,” the Novio mused, pushing back his chair as his cider-drenched hake was set down before him. I was able to make room for dessert as I felt the first small rumblings of our child – a quarter Asturian anyway – deep in my belly. That, or a satisfied stomach. The road back from Grado was far bumpier – I nearly scratched the car on the narrow road behind Pepe el Bueno, stalled twice due to the car’s sensitive gears and was kindly asked to just navigate us back to Faedo. We made it as far as Pravia before losing signal and relying on our instincts to guide us. An hour later and after risking bottoming out on an old cattle route, I collapsed into bed as clouds rolled over the valley, heavy with rain. Slipping on my bathing suit – still a bit damp from my dip the day before – we made one last beach stop at La Concha de Artedo. I’d been but a kilometer from this beach on our second morning of the Camino, and smiled remembering a beagle that followed us from the restaurant at the top of the hill all the way down to the next arrow. It was chilly but the time I’d found a dry rock to rest my bag, but the Novio was already darting between rocks, looking for baby andarica crabs that had been washed in with the tide. The pools were warm and shallow, hiding the creatures under rocks full of bígaros and clams. Due to a goof up in our room, Ángel and Agustina had offered to invite us to dinner at the casona, free of charge. Being one of two restaurants in Faedo – the other was a vegan music bar, quite modern for a town whose population hadn’t topped 150 in half a century – she cooked nightly for more than just guests. As dusk fell, the Novio and the propietario shared a few culines of cider and we chowed down creamy croquetas stuffed with local chunks of chorizo and pito al chilindrón, a simple chicken dish in which a whole chicken is cooked and stewed in a vegetable paste. “Mi mujer tiene mucha mano en la cocina,” Ángel would later claim as we thanked them for the phenomenal meal. Indeed, Agustina was a kitchen whiz. That night, the wind ripped opened our heavy wooden shutters. Lightning pounded the valley, and as I lazily pulled the windows shut and locked them, I couldn’t help but think that there’s no wonder the animal products up here taste better – it rains so much! “Bueno, hoy es tu día,” the Novio stated, taking a long drag off of his cigarette as Ángel set a glass of fresh juice in front of me. “What’s on the itinerary? It was my 31st birthday, and I wanted to do what any other 31-year-old-woman would want to do: Go to a dinosaur museum. I patted Chispa on the head once more and thanked Ángel and Agustina for their hospitality. Checking the route before we’d be left without internet once more, we rolled down the Meriva’s windows and slipped back down the mountain. Passing through Colunga before reaching the Museo del Jurásico de Asturias, we gobbled down the rest of our bollo preñao in the parking lot. Being a national holiday, the museum was teeming with kids. I nudged the Novio in the ribs, knowing full well that we’d be skipping the bars for kid-friendly activities in a few short years. The northern coast of Asturias was once home to a number of sauropods during the Jurassic period, and the Las Griegas beach has uncovered a number of bones and the largest dinosaur footprint to date. Forming part of the Costa de los Dinosaurios, the museum is one of Asturias’s top tourist attractions. For someone whose favorite college course was based on the prehistoric beasts, I was a bit skeptical due to the number of reproductions (I am a purist, oops), but to have free election over what to do that day, I enjoyed pointing out the different features of dinosaurs and goofing off in the reproductions park. 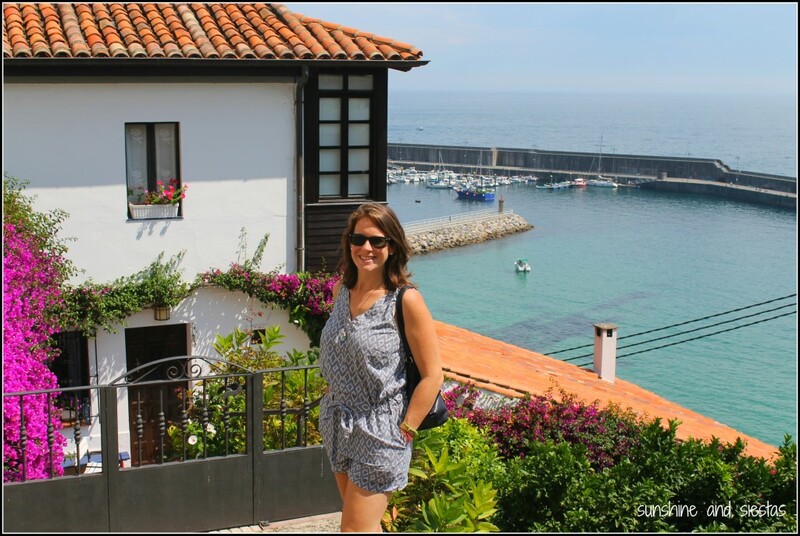 Lastres was just around the bend of the AS-257, another quaint village perched on a cliffside. The stone houses reminded me more of the southern coast of France than the northern coast of Spain, with its red roofs and bougainvillea spilling out of window pots. Though we’d eaten everything on our list – from cheese to fabada to bollo preñao – the Novo hadn’t had vígaros. As a kid vacationing near Lastres, he’d pick the shiny black mollusks off of rocks and dig out the worm with his fingers rather than using a straight pin. A waitress spread an old, faded tablecloth at one of the beachside restaurants once we’d descended the stone stairs to the small port. As a summer baby, I was clear about lunch – freshly caught seafood. Time stopped for an hour despite the ancient clock tower ringing every quarter hour. As the restaurant where we sat on stools fishing the vígaros out of their shells filled as the lunchtime hour creeped slowly up, we ordered a plate of razor clams, piping hot with a hint of parsley and lemon, and squid in black rice. I’d have a birthday pastry at some obscure rest stop a few hours later, the Novio promised. Tempting fate, we decided to return to Madrid a bit earlier than planned, checking the traffic report on RNE every hour. Once again, we had the Picos behind us in the rearview mirror after an hour, then the Castillian plains before ascending Guadarrama and entering back into the capital. 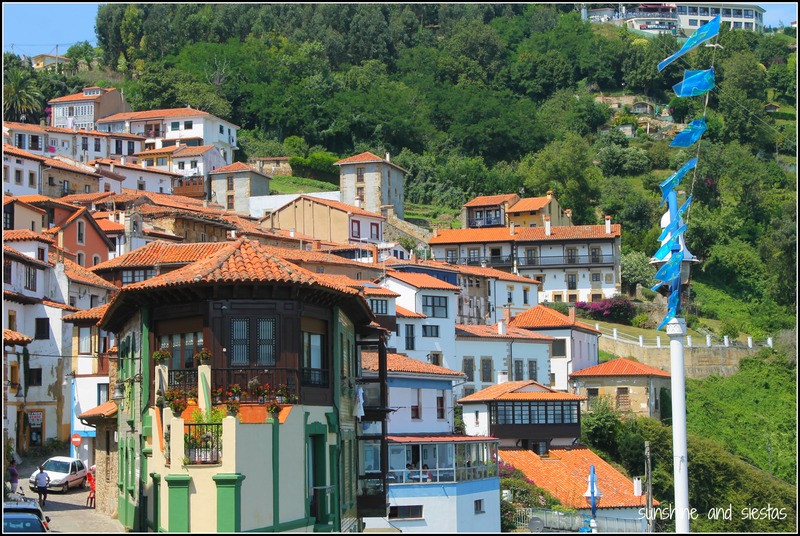 Perhaps on my next trip to Asturias – Micro in tow – we’ll focus on the oriental part of the region. The Lagos de Covadonga, the tiny mountain villages tucked into crags and providing sweeping views of Bay of Biscay, the artsy cities of Llanes and Ribadasella. Or perhaps he’ll eat cheese at el Reguerín and hunt for crabs with his father at Concha de Artedo. 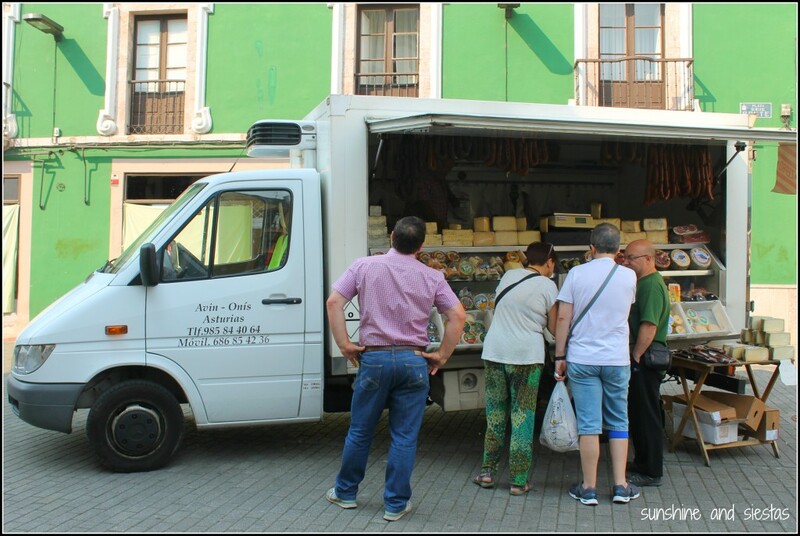 It’s easy enough to explore Asturias by bus or train, I suppose, but half the fun are the tight turns, the stoping for cows and the sleepy little hamlets where vecinos wave you down to try and sell you their fresh milk or butter. Save walking along the coast, it’s the only way to go. EasyTerra Car Rental, a Netherlands-based rental agency that compares well-known suppliers in more than 7,000 loctions worldwide, graciously picked up our tab. We paid for gas and navigated tractors trails and tight mountain curves ourselves – so all of the opinions expressed here are my own. That said, their website is user-friendly and their prices are the cheapest we found! 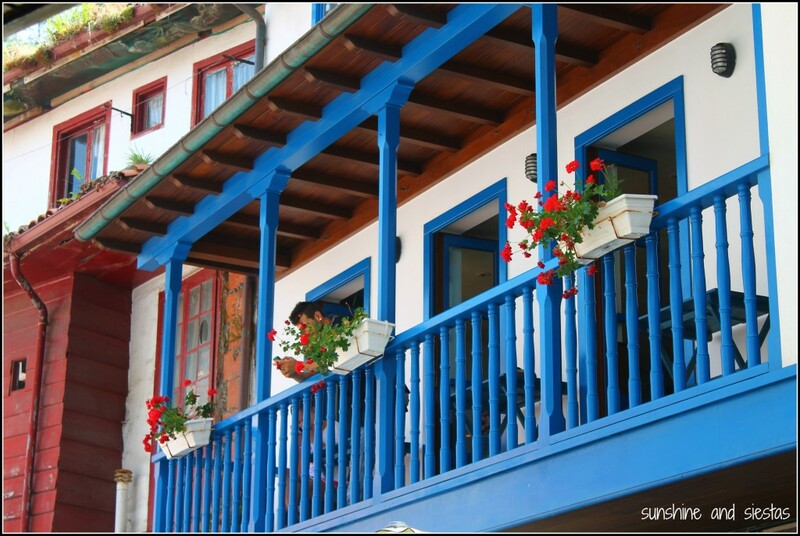 Have you ever driven or walked through Asturias? What places would you recommend? Eight years ago, I welcomed my parents to Spain for the first time. They arrived to Málaga via bus after several cancelled flights and a mad scramble to get them from Heathrow to Andalucía before Christmas Eve. Once they finally arrived, jet lagged, smelly and not amused with my cry of ‘Bienvenidos a España!’ we grabbed our rental car and beelined out of the Costa del Sol’s capital and didn’t return. 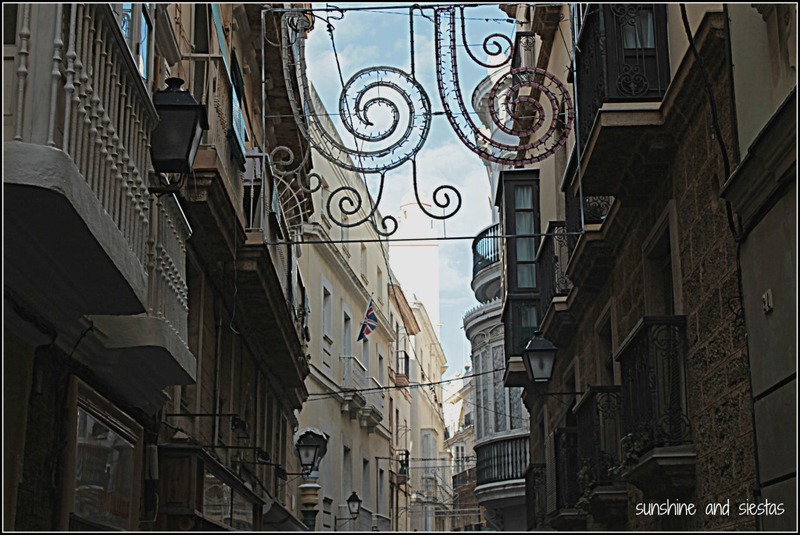 We missed out on the opportunity to explore what is becoming a cultural capital and a city that embodies cool, and I have yet to really get to know more than Málaga’s airport. 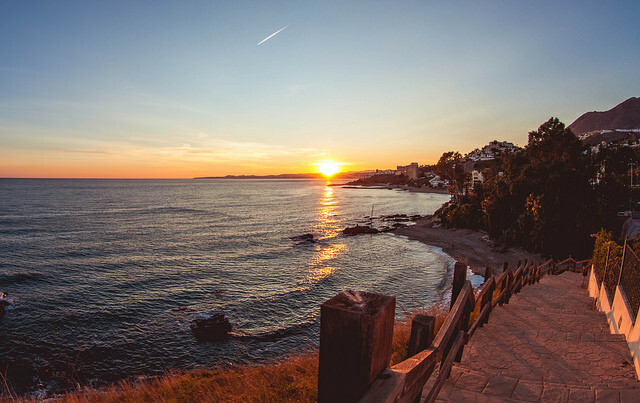 Many visitors to the golden shores of Spain’s Costa del Sol choose to bypass Málaga in favor of the nearby beach resorts. It’s a shame – this vibrant city offers a great selection of cultural sights and historic gems, plus great dining options, all on the Mediterranean Coast. If you’re visiting for the first time, you may be surprised by these five facts about one of Spain’s up-and-coming cities. 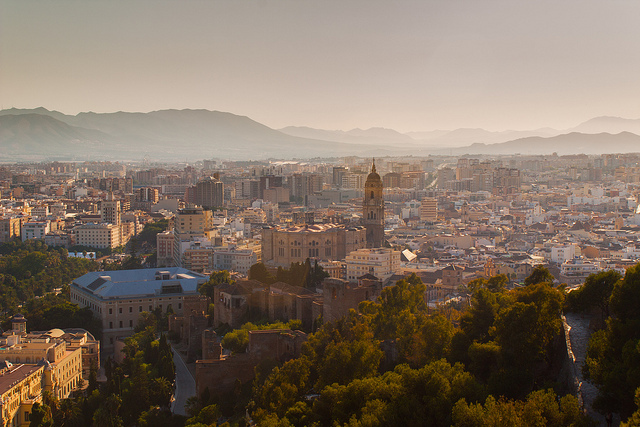 Arguably the most influential artist of the twentieth century, Picasso remains one of Malaga’s most renowned citizens. Nestled in the heart of the city’s historic center, visitors can explore the artist’s birthplace and family home during his formative years. An exhibition displays artifacts from his childhood and personal mementos from his family. From here, art fanatics can visit the Picasso Museum located in the 16th century, Buenavista Palace. Showcasing over two hundred and thirty pieces, it’s a one-of-a-kind opportunity to marvel at some of Picasso’s best works. Plus, it’s just a stumble from great tapas joints (and we stayed at an awesome AirBnB nearby for my despedida de soltera!). I mean, it’s no Feria de Sevilla, but Málaga’s beachside feria is allegedly just as much fun (and without all of the pomp). 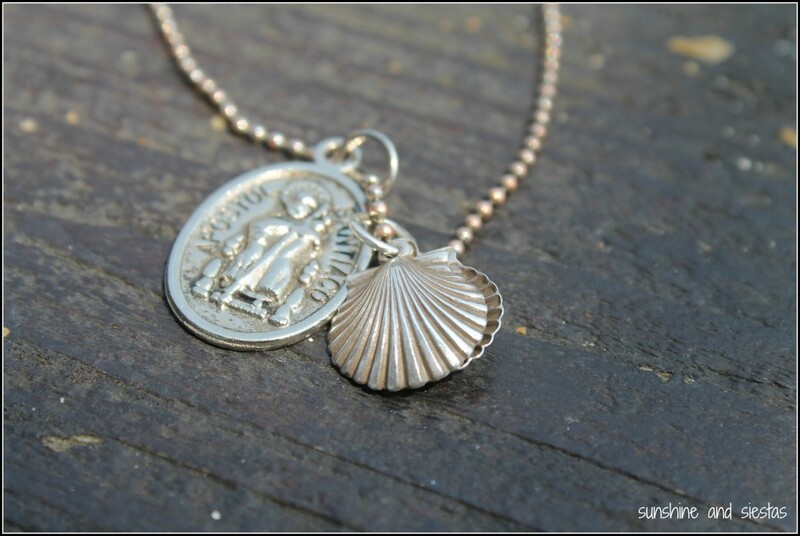 The annual fair takes place in August and was established to commemorate the Catholic reconquest of the city in 1487. 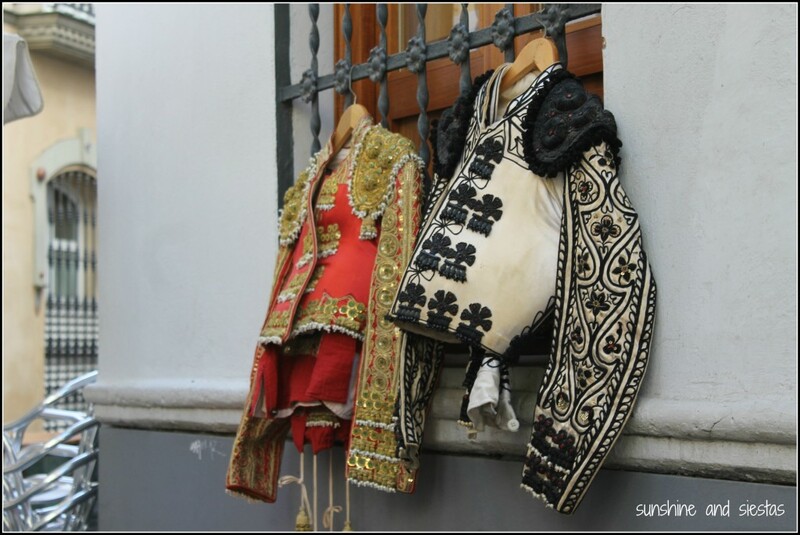 The weeklong celebration is the time to enjoy authentic Andalusian cuisine, marvel at the trajes de gitanas and take part in a sevillanas dance if you’re fueled by rebujito. And it’s ok to go in street clothes – this fair is far more low-key than Seville’s, so you don’t have to put on the airs or sneak your way in to a private tent. Picasso isn’t the only famous malagueño: another notable native is Hollywood A-lister, Antonio Banderas. Born in 1960, the famous actor began his studies at the College of Dramatic Art in Malaga. Although he no longer resides in Spain, Banderas does return every year to celebrate the Holy Week festivities. Taking place from Palm Sunday through to Easter Sunday, Banderas joins in several of the processions as a costalero, or a brother charged with carrying the heavy floats through the streets of the city. Spend a short time in Malaga and you’re sure to come across the handcrafted flowers, Biznagas Malagueñas. Traditional to the region, these are often sold by street vendors, known as biznagueros who are often dressed in an outfit comprising of a white shirt and red waistband. The floral creations are famed for their sweet smelling scent, usually made with a combination of dried thistle and freshly picked jasmine. Many people are unaware that they have a secondary purpose – they’re also said to repel mosquitoes. It may come as no surprise that the capital of Spain’s Costa Del Sol receives some of the best weather in Europe, and that it’s not limited to the summer months. With roughly 300 days of sunshine every year, this destination is perfect for a sun worshiper’s fall getaway. The winter also stays pleasantly warm with very few days of rain and highs reaching an impressive 20 °C. The vitamin C alone is worth it. 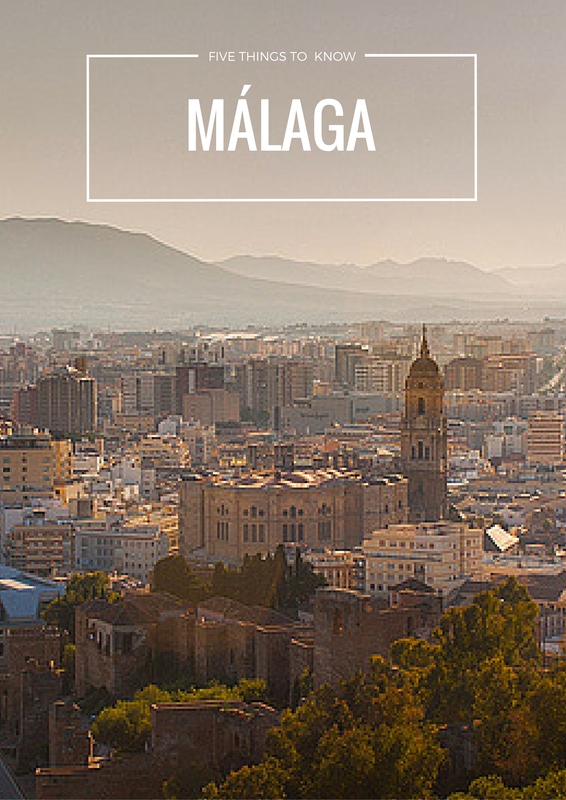 I need a weekend escape to Málaga – what should I see, do and eat?